I recently discovered a site which will send you free books in exchange for an honest review. I never expected to be so touched by the first book I received! 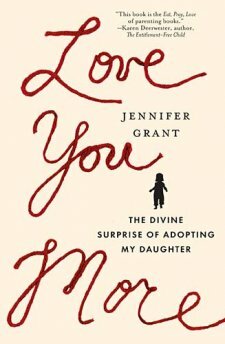 I read “Love You More” by Jennifer Grant, and absoutely loved it. My dad is adopted, I have cousins who are adopted, and we would like to adopt someday. So, I was excited to dive right in! From the very first word to the final sentence, author Jennifer Grant draws you into her story of love, hope, and waiting. Her vulnerable and honest tale is written in such a way that you are able to envision the scenes about which she is writing. She leads the reader on a journey of joy and pain as she walks through her family’s adoption story. Mrs. Grant writes realistically and does not paint the picture of adoption through rose-colored glasses. She acknowledges the reality of adoption (including the problems that can arise) and even discusses the reasons why people adopt (and why they shouldn’t). From honesty about her own emotions and fears to adding spiritual and historical contexts to create a clearer picture for the reader, the entire book is based on fact and is incredibly real. She explains the journey of natural motherhood in a way that is relatable and enjoyable by women in any stage of life—from being newly-married to having three kids, she discusses each step of the way. Her faith is evident throughout the book and she clearly shows how God orchestrated the entire adoption process. This book is riveting, and it provokes deep thought about tough issues such as social justice, poverty, and, of course, adoption. Mrs. Grant is a very talented writer and it is hard to put this book down! I highly recommend this book to anyone who has ever considered adoption, but also to those who haven’t given it a thought…this book just might change your mind.